PROPHETSTOWN – Charles Douglas Sandrock, 64, of Prophetstown, died Thursday, Jan. 7, 2010, at University of Iowa Hospitals and Clinics, Iowa City, Iowa. Service will be at 11 a.m. Wednesday at First Lutheran Church, Prophetstown. Visitation will be from 4 to 8 p.m. Tuesday at the church. Burial will be at Riverside Cemetery, Prophetstown. Memorials may be made to First Lutheran Church, Prophetstown, or the Juvenile Diabetes Foundation. Charles Douglas Sandrock was born Dec. 28, 1945, in Moline, the son of Casper Ernest and Bernice Marie (Pearson) Sandrock. He married Sherrilyn Overbey on Aug. 6, 1966, in East St.Louis. Doug worked for 28 years at Penberthy, Prophetstown, where he was a machinist by trade, but also managed the company’s credit union. Most recently, he worked for Illinois Unemployment Bureau. 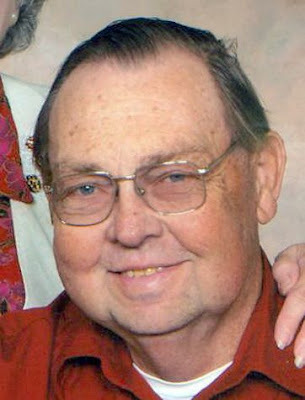 Doug was an active member of First Lutheran Church, Prophetstown, where he had served on the church council, sang in the choir and was head usher. He also was a member of Alpha Phi Omega Fraternity at Western Illinois University. Doug was a big fan of the Iowa Hawkeyes, St. Louis Cardinals, John Deere tractors, and Ford Mustangs. Survivors include his wife, Sherry; children, Jill Marie and husband, Alan Swearingen of Columbia, Mo., Charles Victor “Vic” Sandrock of Bloomington, and Abigail Lyn Hooks of Rock Falls; five grandchildren, Ryan James and Alyvia Mae Swearingen, Myria Ashanti Lyn and Emyli Eve Oresa Hooks, and Revin Christine Sandrock; brother, Carlyle (Audrey) Sandrock of Prophetstown; sister, Charlotte LaVonne (Jack) Duling of Shellsburg, Iowa; and an aunt, Darlene (Clyde) Nelson of Rock Falls. Arrangements were completed by Gibson Funeral Home, Erie.